When one first comes to Christ with a true conversion complete with repentance, they are often on fire for Christ. Their passion and zeal bless their congregation as they move from an eternity in hell into newness of life in Christ Jesus. They are so grateful, so excited to meet their Lord and be developing a personal love relationship with Him, so filled with His love...it's awesome! Often those precious souls have another Christian tell them that sure, they are on fire now, but they will "calm down" in time...like them! The longer we have a deep, personal love relationship with anyone, the more we love them. The same is true of our relationship with God Almighty. If we live our lives in obedience to Him, seeking Him with all our hearts as He tells us to, led by and cooperating with His Holy Spirit to produce Fruit of the Spirit in our lives, then our relationship with God deepens, becomes more rich, more powerful in time. Rev. 3:16 "So, because you are lukewarm—neither hot nor cold—I am about to spit you out of my mouth." 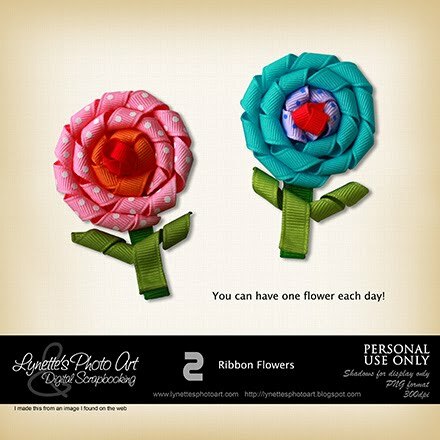 Today I'm giving you one of these fabulous Ribbon Flowers I made from an image I found on the web. Tomorrow you can have the other one - enjoy!